Enova’s Pre-Transmission Parallel Hybrid System locates the electric motor between the engine and transmission. Click to enlarge.Enova Systems, Inc. has delivered the first 70 pre-transmission hybrid drive systems to First Auto Works for application in a hybrid bus. FAW has ordered an additional 150 hybrid drive systems for delivery in 2009. Enova Systems and FAW have executed an agreement to supply a further 800 pre-transmission hybrid drive systems in 2010. Enova’s Pre-Transmission Parallel Hybrid System locates the electric motor between the engine and transmission. Click to enlarge. First Auto Works is one of China’s largest vehicle producers, manufacturing in excess of 1,000,000 vehicles annually. The Enova drive system will be integrated and branded under the name of Jiefang. The Jiefang 12-meter hybrid bus can carry 103 passengers and travel at a maximum speed of 85 km/h (53 mph). The bus meets Euro III emission standards. It will consume 30 liters of fuel every 100 kilometers (7.8 mpg US) and discharge 20% less emissions. Enova’s Pre-Transmission system locates the electric motor between the engine and the transmission. Both the electric motor and the existing vehicle’s engine operate simultaneously to drive the wheels during acceleration. As the vehicle slows, during braking, the electric motor functions as a generator to recharge the batteries. Because the electric motor is placed directly between the engine and transmission, the system typically requires modification to the engine installation and thus is suited to OEM applications, as opposed to retrofits. These hybrid power buses are part of China’s initiative to produce 500,000 electric and hybrid power vehicles. The initiative will account for 5% of the automobile market, which is in accordance with China’s three-year development plan for the auto industry, released in February. China is offering subsidies in 13 trial cities, including Beijing, Shanghai, Changchun, Dalian and Shenzhen. Each energy-saving or new energy vehicle used in public services attracts a subsidy of up to 600,000 yuan (US$87,780), according to a new policy jointly issued by Ministry of Science and Technology and Ministry of Finance. The municipal government of Dalian and the city of Changchun has ordered many of the hybrid buses. 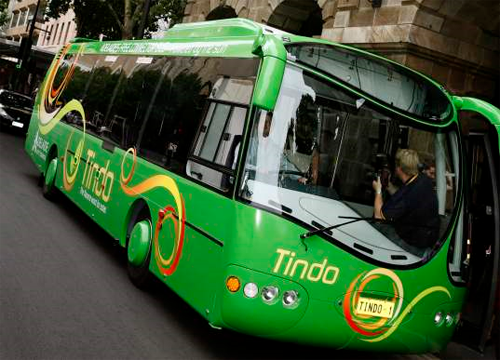 Fifty buses will be running in the city during the Summer Davos event, all of which will incorporate Enova’s drive system. Enova produces four drive configurations (Pure Electric, Series Hybrid with Diesel Generator, Pre- and Post-Transmission Parallel Hybrids) for customers including Navistar’s IC Bus Division, Smith Electric Vehicles and the China FAW Group Corporation.